Generate revenue and profit while meeting green targets and contributing to more renewable energy. Your roof area or land is 300 square meters or bigger? Use it to generate power with a rooftop / carport / ground solar plant. 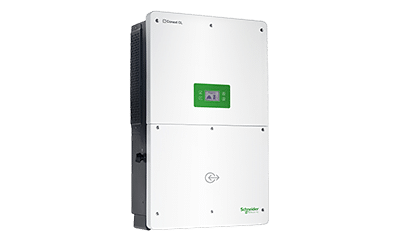 Install panels, convert power with Schneider Electric solar top-of-the line string inverter for commercial & industrial use. Connect to the grid to sell your production. Our grid-tied inverters enable easy grid connection, control monitoring with ConextTM Gateway and Insight 2 (release end of 2018). We provide transformers, protection device (surge, arc), switches, power meters, grid analyzers to complete the solution. Our network of trusted installers delivers the solar plant from quote to maintenance. We help you to calculate your financial returns and generate revenue and profit from the selling of energy (where allowed).